"Sanghelios… she is a beauty of a world." Sanghelios, also known as Urs IV and designated CE-80-9012 d by the Forerunners, is the homeworld of the Sangheili species. Sanghelios is the fourth planet in the Urs system, a triple star system containing Urs, Fied, and Joori. The planet is orbited by two natural satellites, Qikost and Suban. Sanghelios is a world with a very militaristic and feudal society, a result of the planet's harsh environment. As a space-faring species, the Sangheili have colonized multiple worlds in addition to Sanghelios as they expanded the reach of their own civilization and later the empire of the Covenant. Though the Sangheili have colonized dozens of independent worlds, Sanghelios still remains central to the government and culture of the species. Following the Human-Covenant War and the dissolution of the Covenant, Sanghelios had become embroiled in a civil war known as the Blooding Years that encompasses most of the planet and many Sangheili colonies. Though the Swords of Sanghelios have effectively taken control of the planet, many other factions seek to overthrow the government. Ancient Sangheili marching on Sanghelios. The Sangheili evolved on Sanghelios in tropical wetlands on the planet. Sanghelios had at one point been visited by or had been in contact with the Forerunners, as Forerunner artifacts were left throughout Sanghelios' surface. During their contact, the Forerunners had placed a Guardian on Sanghelios, in order to enforce their Mantle of Responsibility and police the Urs system. The Guardian rested for many millennia in the deeps of the Csurdon Sea, over which the city of Sunaion would later be built in homage to the great machine. Towards the end of the Forerunner-Flood war, the Librarian visited the planet to retrieve specimens of the Sangheili for preservation as part of the Lifeworkers' Conservation Measure. After the firing of the Halo Array, the Sangheili that were preserved aboard Installation 00 were reintroduced to their homeworld to begin rebuilding their culture. After being returned to their homeworld, the Sangheili discovered artifacts left by the Forerunners on their planet. The Sangheili revered the objects these "gods" had left, and considered tampering with them a heresy beyond any other. A tyrannical Arbiter once took control of the entire Qivro continent, but he was overthrown by a coalition of kaidons known as the Swords of Sanghelios. The first Sangheili interplanetary probes were launched from towers of glass and steel on Sanghelios. Sometime after, around the time the Sangheili developed anti-gravity technology, the planet experienced a climate shift, and the Sanghelios launch towers were abandoned. Over time, the Sangheili on Sanghelios developed their technology and became a space-faring race, subsequently colonizing several worlds. At some point, the Clan Battles of Sanghelios occurred on the planet. One of the battles was fought between two large clans in the forest of Tarjak. In 938 BCE, the Sangheili encountered the Reformist San'Shyuum—a race who also worshipped the Forerunners as gods, but had utilized Forerunner technology for their own needs, believing the technology had been left behind by the gods as gifts for their children. This sparked a war between the two races over how to treat the relics. At first, the Sangheili attempted to keep the San'Shyuum away from Sanghelios and the San'Shyuum were unable to discover the location of the Sangheili homeworld. Part of the war was fought on Sanghelios, with the San'Shyuum's keyship, the Forerunner Dreadnought, devastating military forces planetside. In time, the Sangheili learned of the San'Shyuum's belief in the Great Journey, where the Forerunners used the Halo Array to ascend to a god-like state, and wished to repeat this process on themselves. Coupled with this belief and the fact that the cause of war was obsolete, the Sangheili agreed to unite with the San'Shyuum into an alliance to avoid mutual extinction. In 852 BCE, the two races signed a treaty known as the Writ of Union to form the early Covenant. However, the following year, a civil war began on Sanghelios that would be referred to as the Rending. Several Sangheili opposed the Writ of Union, most notably Ussa 'Xellus. Some Forerunner artifacts were even damaged during the rebellions. In response, Covenant attack fighters were sent to the state of Xellus and destroyed the state and keeps, killing hundreds of Sangheili. This led to the 'Xellus clan fleeing to the southern region of Nwari on Sanghelios to plot against the Covenant, though they were eventually forced to flee to the Refuge. Sanghelios became the initial capital of the Covenant Empire. However, once the mobile city of High Charity had completed its construction in 648 BCE, Sanghelios returned to Sangheili exclusivity. The planet continued to provide soldiers for the Covenant military for centuries. Many Sangheili manufacturers on and around the planet provided weapons and vehicles for the Covenant. During the Human-Covenant War, many Sangheili warriors from Sanghelios joined the Covenant's campaign against humanity until the Great Schism. The Swords of Sanghelios engage Jul 'Mdama's Covenant at Sunaion. After the Human-Covenant War, Arbiter Thel 'Vadam and Rtas 'Vadum returned to Sanghelios after aiding the United Nations Space Command in defeating the Covenant. Most of the Sangheili who served in the Covenant returned to Sanghelios or its colonies when the Covenant was dissolved. However, the dismantling and abandonment of most of the Covenant's religion and politics led to civil unrest and feuding throughout Sanghelios. The Arbiter was considered by many as the leader of Sangheili that truly abandoned the Covenant. 'Vadam planned to visit each state to make his case for permanent peace with the humans they had battled for so many years. These reforms did not meet with universal approval. By January 2553, there was great dissent among disparate Sangheili factions, especially from the more devout believers in the Forerunners' divinity. Some, such as Avu Med 'Telcam and his Servants of the Abiding Truth, saw the Arbiter as a traitorous leader that has betrayed their faith and sought to finish their war with humanity. Since March 2553, a majority of Sanghelios has become engulfed in a civil war between the Swords of Sanghelios loyal to Arbiter Thel Vadam and the factions—such as the Servants of the Abiding Truth—that sought to worship the Forerunners as gods and exterminate humanity. By 2558, the Arbiter's followers were firmly in control of the planet, though Sanghelios and most Sangheili colonies remain in a tense state. In that year, Jul 'Mdama's reformed Covenant faction established a presence on Sanghelios at the city of Sunaion in an effort to strike the Swords of Sanghelios by attacking the state of Vadam. However, the Arbiter learned of the Covenant's intentions and the Swords of Sanghelios created a forward operating base at Nuusra near the city, where they moved to attack the Covenant at Sunaion which resulted in the Battle of Sunaion. The battle marked a fatal blow to Jul 'Mdama's Covenant. During the battle, a Forerunner Guardian that had lain beneath the Csurdon Sea for millennia emerged and departed for Genesis. At one point, a human-Sangheili "librarian" team began to research archived Covenant records on the planet. A Sanghelios cliffside, with ruins carved into it. A harsh planet, Sanghelios is located on the innermost edge of the Urs system's habitable zone, allowing for a wide variation in vegetation and temperature on the planet. With a diameter of 15,038 kilometres (9,344 mi), Sanghelios has a gravity of 1.375 Gs and an average surface temperature of -5°C to 96°C (23°F to 204.8°F). The planet has a diameter of 15,038 kilometers, making it larger than Earth. The land masses and continents are more scattered in relation to bodies of water. Sanghelios' sky varies in hue from a bright yellow to a blood red, due to large amounts of suspended particles in the upper atmosphere, but can also be blue. The planet's harsh and capricious environment is caused by Sanghelios' three suns, Urs, Fied, and Joori. Like Earth, its atmosphere consists of oxygen, argon, and nitrogen, but also has a reddish hue to it. Water on the planet can have various hues which include blood red, orange, yellow, cyan, blue and even purple or magenta. The surface of the planet is mostly composed of water, though Sanghelios has five individual continents: Kaepra, Qivro, Tolvuus, Vaardma, and Yermo..
A map of the planet. Large desert regions stretch across the interior portions of the planet's continents, forcing the significant portion of Sanghelios' population to live on the coasts and islands. These locations are usually encircled by steep mountain ranges or rocky tombolo drifts, which provide much needed protection during the planet's harrowing rain season. Many Forerunner artifacts and structures exist on the planet, which are the topic of worship, as well as the cause of historical wars between the Sangheili and the San'Shyuum before the formation of the Covenant. The large size of Sanghelios' two natural satellites—Qikost and Suban—has great effects on the planet's tides.Frigid winds from the south pole of Sanghelios were spread across the southern regions of the planet. The landscape of the continent of Qivro. Sanghelios is home to numerous animal and planet species, widely different from those on Earth. Some of these animals are domesticated, like the colo which is farmed across Sanghelios for its meat. Doarmir are furry animals that are hunted for their fur, which is used for clothing. Helioskrills are large, predatory creatures that live in the mountains of Sanghelios, respected by the Sangheili for their hunting positions. Intestinal parasites—nishum—are common pests on the planet. The waters on Sanghelios are home to large, predatory aquatic cephalopods that prey on unsuspecting creatures that wander into their territory. The skies of Sanghelios are often filled with a variety of avian-like animals. Sangheili farmers would train predatory animals, known as the quillick, to hunt mammals for them. 'sKelln are leather-winged predatory animals capable of flight. Thremaleon were a vicious, nearly extinct, species of lizard that the Sangheili would use for leather. The hooved keifra are also native to Sanghelios, as are the velithra which are domesticated by the Sangheili to serve as beasts of burden. There are also small, rat-like creatures that live on the planet, hunted by adolescent Sangheili. The planet is also home to numerous types and varieties of vegetation. Irukan is a species of grain commonly grown on the planet, usually by Kig-Yar. Kafel is a plant with a durable, wooden trunk that is often used in Sangheili construction. "They ruled their world with pride, and vigilance, surviving the perils of both land and sea. These were the Arbiters of old; part king, part judge. Warrior-rulers unlike any of which would follow." An ancient Arbiter leading his people. Sanghelios is considered to be the cradle world and the center of government of the Sangheili. As with the nature of Sangheili governments in general, the planet has no global capital and most of Sanghelios' inhabitants live in city-states led by and named after a particular Sangheili family. A given state is governed by a single clan residence and assembly house known as a keep, headed by a kaidon selected by a council of elders. There are usually a number of "client keeps" belonging to different clans under the leading keep's rule, though a state's elders will assume the kaidon's clan name as a title signifying their position, regardless of the name of their own family keep. The states on Sanghelios vary greatly in size and wealth, ranging from small, rural ones like Mdama to urban city-states like Ontom, which mix ancient Sangheili architecture and modern structures and aesthetics. As a developed Sangheili world, Sanghelios is host to hundreds of different keeps competing for power and influence by utilizing both politics and martial force. Sanghelios was once led by an Arbiter, a title that was part king and part judge. During the early years of the Covenant, Sanghelios was governed by the Council of City States. The planet was initially used as the capital of the Covenant, until the mobile city of High Charity completed construction in 648 BCE. Afterwards, Sanghelios returned to Sangheili exclusivity, though the planet remained under the Covenant's control and served as a central world in the empire's dominion. After the beginning of the Great Schism and the Covenant's resulting dissolution, Sanghelios' states briefly remained divided. However, during the ensuring Blooding Years, a civil war in which numerous Sangheili clans and factions battled for dominance over Sanghelios and the Sangheili species, the Swords of Sanghelios effectively became the single world government for the planet. Led by Arbiter Thel 'Vadam and a grand council of kaidons, the Swords of Sanghelios attempted to quell any faction that attempted to seize control of the planet for themselves. Rear Admiral Horatio Temkin served as the United Nations Space Command's ambassador to Sanghelios in 2558. Culture on the planet is based around a type of feudal manorialism with Sangheili on Sanghelios live in tightly-knit clans. Outside the cities, some of which feature towering structures of both classic Sangheili and Covenant-era designs, Sanghelios' landscape has stayed mostly unchanged for several millennia; the terrain is mostly agricultural, and the keeps mostly follow ancient, pre-Covenant architectural styles. Those who committed crimes against the government may have been allowed to fight to the death in an arena. During the Sangheili's long service with the Covenant, the Covenant had a large presence on the planet. Clans and cities were allowed to develop in isolation, but any individual who renounced Sanghelios or rebelled against the government could face imprisonment or execution. Sanghelios is the location of the single greatest population of Sangheili. Most of Sanghelios' population remains on the planet for their entire life. However, those who showed either intellectual or physical skill were often recruited by the Covenant. By 2552, Sanghelios was inhabited by approximately 8.132 billion individuals. However, the population sharply dwindled to less than four billion after the Blooding Years, a civil war that engulfed most of the planet; many of the planet's inhabitants fled to the population centers on Sanghelios' natural satellites of Qikost and Suban. After the dissolution of the Covenant, Unggoy and Jiralhanae laborers continue to live on the planet as workers for the Sangheili, and Kig-Yar merchants often visit to trade with the planet's inhabitants. Thel 'Vadam, the Arbiter of the Swords of Sanghelios, was born in the state of Vadam. The name "Sanghelios" comes from the Latin sanguis and the Greek helios meaning "Blood-Sun". It is implied that this may refer to the emphasis on blood in the culture of the warrior Sangheili that live there. The Doctor Who episode "Planet of the Dead" features a planet called San Helios, which is also part of a triple star system. In Halo: The Cole Protocol, Sanghelios is mistakenly referred to as "Sanghelion" in chapter headings. An illustration of Sanghelios from Halo Waypoint. Sanghelios as seen in the Bestiarum. Ancient Sangheili on the surface of Sanghelios. An expansive horizon of Sanghelios. A duel between Fal 'Chavamee and a rivaling Sangheili in forest terrain on Sanghelios. Relatively old Sangheili architecture (circa 2152). 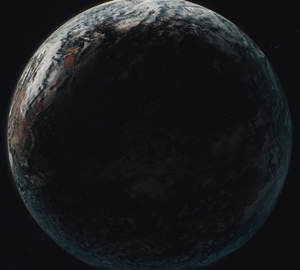 An image of either Suban or Qikost, both of which are Sanghelios' natural satellites. The future Shipmaster of the Fleet of Righteous Vigilance, duelling with a fellow clanmate on Sanghelios. An unknown aquatic creature which inhabits Sanghelios. It is currently preying upon a Sangheili submerged within water. Sanghelios from the Halo Encyclopedia. Sanghelios, as shown in the Waypoint Bestiarum. A rough ocean on Sanghelios. A Sangheili boat on Sanghelios in a storm. Concept art of Sanghelios for Halo 5: Guardians. Concept art of a city on Sanghelios. Concept art of Sanghelios cliffs with a Guardian in the background. Concept art of ruins, with a Kraken to the side. Concept art of cave ruins. Concept art of a battle on Sanghelios. Concept art of Sanghelios with a Guardian and several planets in the background. Background matte painting of a coastline on Sanghelios. Concept art of ruins on Sanghelios. Sanghelios in Halo 5: Guardians. A view of the planet in Halo 5: Guardians. Qikost in orbit around Sanghelios in Halo 5: Guardians. Suban in Halo 5: Guardians. Spartan Jameson Locke on Sanghelios. A UNSC D79-TC Pelican over buildings on Sanghelios. A view of Qikost and Suban from the surface of Sanghelios in Halo 5: Guardians. Sangheili ruins on the planet. Jul 'Mdama's Covenant forces entrenched in ancient ruins. ↑ The term "Sangheilian" has been used in a Halo 3 Plasma Rifle article on Bungie.net, in the Bestiarum's San'Shyuum article, and in the more recent Eleventh Hour reports on Halo Waypoint. In most cases, the term seemingly goes beyond the scope of Sanghelios itself, suggesting that it is an adjective corresponding to the Sangheili people.